We are missing a cover for the hole on the faceplate of this White Rotary 659-X. When we bought the machine we didn't know if it had all the pieces or not. With some help from ISMACS members we were able to see what the missing part resembles. We were unsure if the missing part would effect sewing ability. 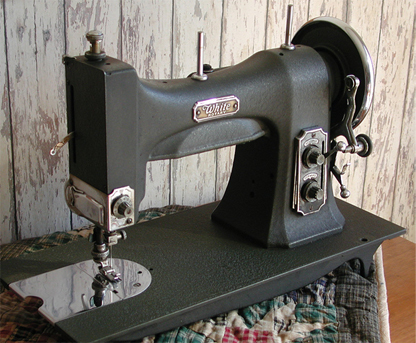 When we buy a vintage or antique machine, we like to get only ones that are complete, look good, and have a fair chance that they can be made to sew quilt patches. This machine was obviously missing a piece, but it was so "odd-looking" that we had to have it anyway. A complex disc assembly is in the area which required disassembly to lubricate the needlebar. 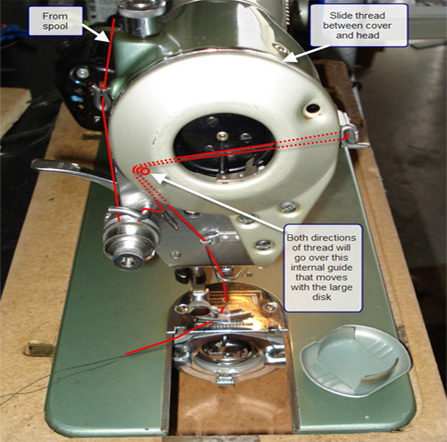 We were lacking manuals for this machine so we were unable to determine a proper way to thread it until Scott came to our rescue and sent us a photo of his machine with a line drawing showing proper threading. (see image below). During October 2011, a friend in Colorado sent us a copy of a manual. Thanks for that. Now we need to take the machine down from the shelf and again try to sew with it. It sews only a straight stitch forward and reverse (not a zig-zag), The feeddog can be raised and lowered and the throat plate is etched for 1/2, 3/4 and 1-inch guide. It is made in Japan. The drive belt was replaced with a Singer belt but insufficient tension can be obtained with the motor lowered to its maximum travel. We are looking for a shorter belt. We like the way in which the light is replaced. The light is accessible through the louvered door seen on top of the arm. The base underside is stamped JUKI 205 and the serial number is 659-8977. The numbers 659 are preprinted on the serial number data plate and we gather this is the model number. We assume the machine was either made by Juki for White, or Juki used a poplar White name. We e-mailed Juki trying to get a manual or any other information. This machine was purchased for $15.00 at an antique mall in Sweetwater, Tennessee during December 2006. This faceplate is one serious piece of machinery. There is a little finger in the hole going around whose purpose is to regulate the upper thread tension. In its current state, its only function we have found for it in our machine is to grab the upper thread and twist it around into a real bird's nest. Now that we have Scott's diagram, we will try to resolve that issue. Thanks to Scott Wallis who provided the image above. The solid red line indicates upper thread path. The red line is dotted where the thread path is concealed behind the end cover plate. The thread passes through the tensioner and the spring then up and into the slot to a holding pin then back through the opening then down to the needle. The system is referred to as the "rotary thread take-up system." Note also that his machine has the appropriate end cap (which is removed in this photo). 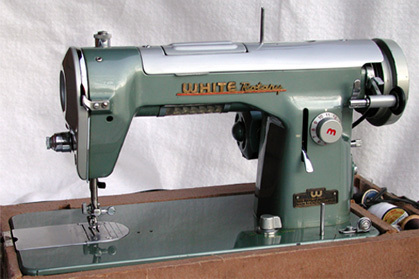 Pictured below is another example of White Rotary sewing machines. It has an army green/greyish crinkle finish. 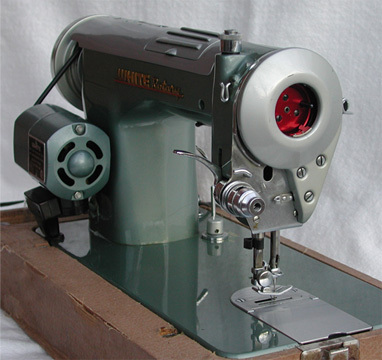 It is unusual in that stitch length can be dialed in differently for forward and reverse sewing using the two dials. The machine came in a nice cabinet but has been removed temporarily to get its picture taken. Pressure feet are installed quite differently on this machine and require proprietary style attachments. Compare the needlebar with the machine above. It sews a straight lockstitch only.